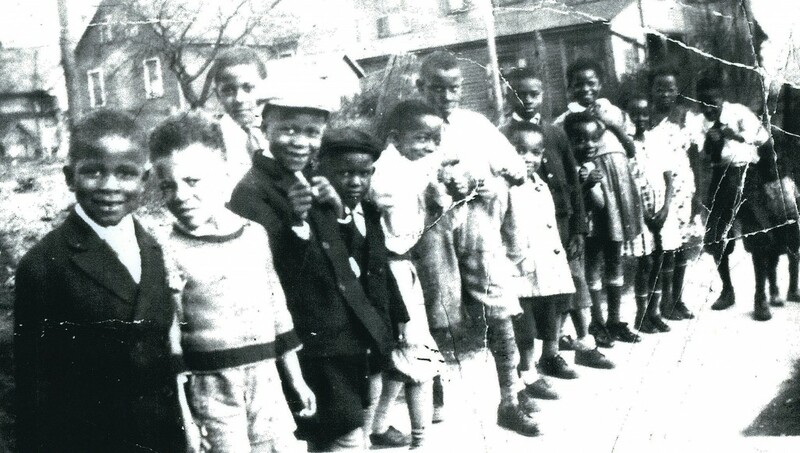 Children who grew up on the Northampton Heights in the mid 30’s (approx. 1938.) 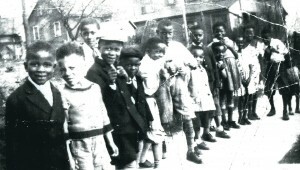 L-R: Ernest Smith, Charles, Isaiah Smith Jr., James Smith, Arthur Stallworth, Bobby Hughes, Larry Hughes, Mack Freeman,The Terry’s or Glass children. The Northampton Heights section of Bethlehem was considered to be the roughest and most out of order section of town. It contained the poorest of citizens who were from the various countries of Europe, such as Russia, Ukraine, Yugoslavia, and Greece. The African-Americans came from states ranging from Maryland through to Texas. Washington Jr. High School was considered the worst school without any data to support that concept. Yet, when one considers the scientists of the Scholarship club, Calvin and Oliver Wallace became engineers, William Brown became a chemist at Fort Dietrich, Maryland, Ernest Smith became a Pediatric Cardiologist, Geneva Smith a Masters Degree nurse, Ada Brady, Dorothy Brown, Isaiah Smith, Dorothy Lewis, otelia Devilson, all teachers; James Smith, college professor, Pedro Boone, JD, Richard Jay, JD from Yale, and became principal at Freedom HS, David Jay, the Chief Administrator of Allentown State Hospital. Delores Williams Blue was assigned as a Secretary at the White House during Lyndon Johnson’s Administration. In 1935, the J. F. G. Scholarship Club was ahead of its time. The students from the Heights were ahead of their time. Now is the time for the African-American students of today to follow those same footsteps and academic challenges of those children born during the worst economic depression and greatest social migration that the African-American has ever experienced in his sojourn from American slavery. Could Any Good Thing Come From Northampton Heights. A local historic society is attempting to block the construction of a $10 million, nine-story building in in Bethlehem. In an area dominated by small two- and three-story buildings, approval was given for a nine-story building to be constructed. The South Bethlehem Historical Society, however, has other ideas. Members of the historical society have asked a judge to revoke the approval for the $10 million building in the South Side, according to The Morning Call. The 96-foot tall building, proposed by developer Dennis Benner, would be located at Vine and West Fourth streets and would feature 37 apartments and a restaurant. While critics say the building would stand out among many other smaller buildings, supporters, including Mayor Robert Donchez, believe it will bring residents back to the South Side. To read more about this story, visit The Morning Call.